Headed to Austin for Pride? There&apos;s no shortage of festivities planned this year. You&apos;re in for a weekend of creativity, solidarity, diversity and community. Whether you&apos;re here for a day or here for the weekend, the Insider Blog has you covered with the hottest events around town. PRIDE Parade. Courtesy of Austin PRIDE. This official Pride movie night brings together a few of Austin&apos;s favorite things: food trucks, film and fashion (oh, and it&apos;s free!). Bring lawn chairs or a picnic blanket for this outdoor screening of "The Adventures of Priscilla, Queen of the Desert" at the ZACH Theatre. This year’s Pride bingo is hosted by LGBTQ local Austin favorites Lady-Grackle Birdbreath and Cupcake. Bingo is free to play and there will be food and drink specials, plus plenty of prizes. Be sure to enter the raffle benefiting Austin Pride. Start your celebrations off right with an evening of laughs at The North Door. Austin Pride and The Comedy Resistance are joining forces to bring you an all inclusive queer comedy showcase, featuring both local and national touring comedians. Don&apos;t miss the official Pride Womxn&apos;s Party, hosted by Lesbutante and the Boss. Celebrate the year of the womxn in a safe and inclusive space, enjoy a cash bar and music from local and international DJs. Austin Black Pride and Austin Pride have teamed up to bring you a night of hip hop, bounce and trap music in East Austin. Turn up with signature drinks, dancers, indoor/outdoor social spaces and a twerk contest. This is the biggest LGBTQ advocacy event of the year, bringing together local and national organizations, live music and entertainers, family-friendly fun and more, from 11 a.m. - 6 p.m.
Join Austinites as they take to the streets to celebrate PRIDE and equality, starting at 8 p.m. The parade begins at the Texas State Capitol, runs down Congress Avenue and concludes in the Warehouse District. Austinites, students, local organizations, visitors, allies, live performers, celebrities, floats and more will create a spectacle unmatched by any other local event. This is the best way to conclude a week of celebrations so head downtown early to get a prime spot for viewing! 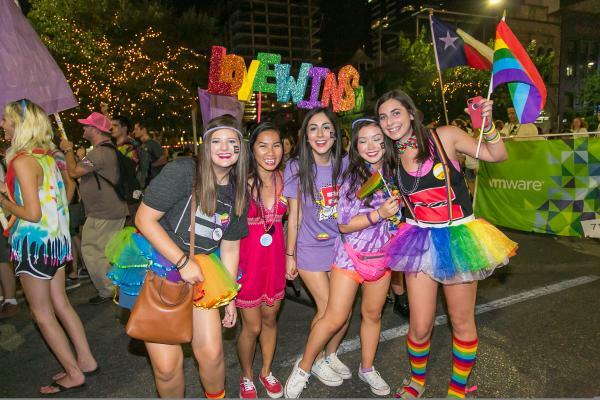 The events above are only a selection of those going on around town - see our Event Calendar for more happenings and check out our LGBTQ section and 2-day LGBTQ Itinerary for more ways to experience the best of Austin!